Candy bouquets can be expensive if purchased from a specialty shop but it's not difficult to learn how to make your own. For less than $20, you can create an impressive gift for almost any occasion. The first step is to choose your candy. 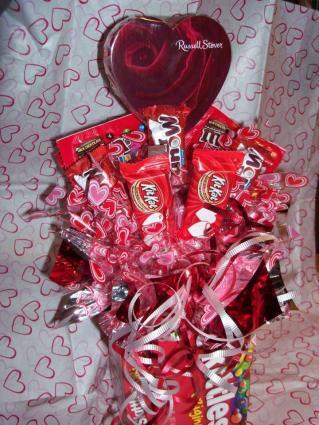 A candy bouquet is typically made with three to six different kinds of candy bars or foil wrapped candies. 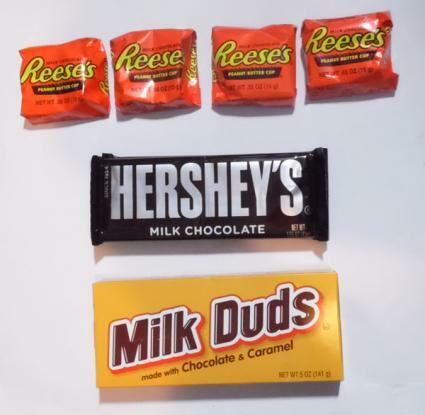 If you're planning on making more than one arrangement, it's a good idea to buy your candy in bulk to help keep the cost of this gift to a minimum. You can use a random arrangement of candy, but many people choose to build the design around a particular theme. Possible themes could include favorite childhood candies from a particular decade, or movie candies with a few packages of microwave popcorn and a video rental gift certificate attached. You can also choose your candy based on the colors of the wrappers, such as red, pink, and white for Valentine's Day. Next, choose the container for your candy bouquet. 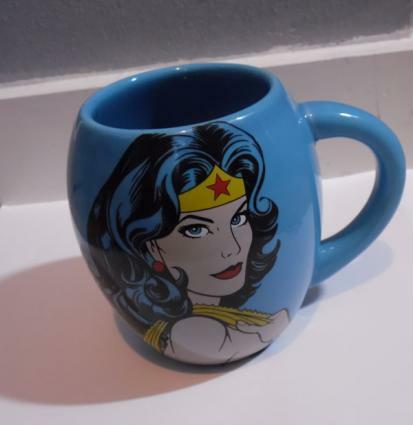 Coffee mugs, decorative serving dishes, or flower pots are good choices but you can be creative with this if you wish. For example, a candy bouquet arranged in the holes of a desk organizer would be an appropriate gift to congratulate a coworker on her promotion. Insert a Styrofoam ball or square into your container. Cover the foam with shredded paper in a color that coordinates with the rest of your arrangement. 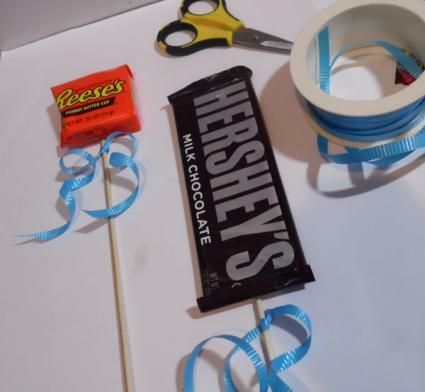 Use a hot glue gun to attach the candy to wooden lollipop sticks or bamboo skewers. Add ribbon bows or curls if desired. To get the most attractive looking curls with your curling ribbon, press one of the blades of an opened pair of scissors firmly against the dull underside of the ribbon, and drag the ribbon over the scissor blade. When you release the ribbon from the blade of the scissors, it will spiral up. Add the candy to the arrangement by pushing the ends of the lollipop sticks into the covered foam in your container. When arranging the pieces of your candy bouquet, begin at the back. The back row should be the highest, with each row getting progressively smaller. Arrange all of the candies so the glued skewers are facing the back of the bouquet. Trim the skewers if necessary so the candy rests at the right height for the arrangement. If needed, ribbons, silk flowers, and other accents can be used to fill in empty spaces in your candy bouquet or to add to the theme of the arrangement. For example, you could use pens, notepads, and a roll of quarters to fill out a candy bouquet for a student graduating from high school. 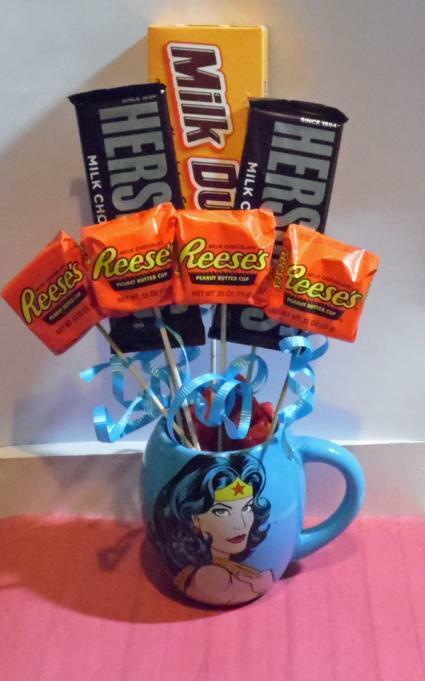 If you'd like to make your gift as edible as possible, consider making a bouquet that uses packaged candies as the container. 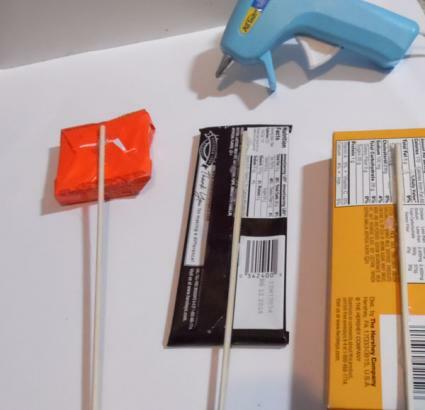 Use hot glue or strong, double-sided tape to glue the corners of the boxes together to form a container. Place folded cardboard in the bottom to make a base and line the box with colored foil or cellophane, leaving several inches sticking up over the edge of the box. Then add the foam and candy skewers, and decorate the bouquet with ribbons. Candy bouquet designed by Linda Shear. 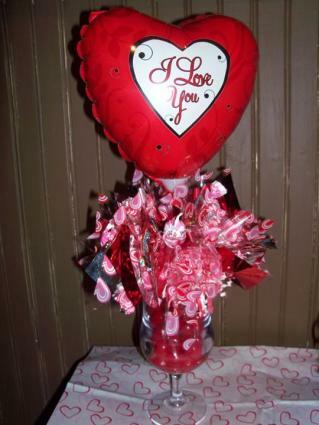 Adding a small mylar balloon to your candy bouquet helps create a special themed gift. A balloon that says "I Love You" is an excellent choice for a Valentine's Day project, but you can find small "Congratulations" and "Get Well Soon" balloons at most dollar stores. Add printed cellophane in a design that matches the colors in the balloon to complete your candy bouquet. Bouquet with mylar balloon by Linda Shear. Another fun variation is to make an arrangement that looks like an ice cream sundae. Fill a sundae dish with M&Ms or jelly beans, then add lollipops and curled ribbons to create the "ice cream" portion of the arrangement. The candy in the bottom of the dish will hold the lollipops in place, so you don't need to worry about adding the Styrofoam. 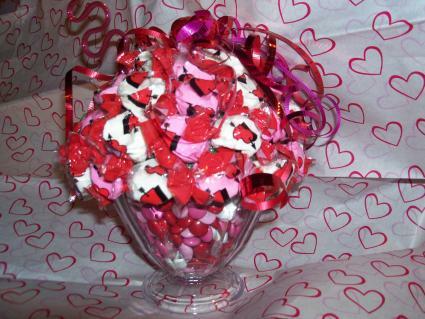 Ice cream sundae candy bouquet designed by Linda Shear. A candy bouquet is a whimsical gift that works well for a variety of celebrations. Before embarking on this project, however, you should always try to find out if your recipient has any special dietary needs so you can look for sugar-free, nut-free, or gluten-free treats if needed.